So starts our new story. Any guesses? Gold may mean Goldie our resident snarky ninja and thief. The holly wreath would seem to imply Christmas. Is this going to be the legend about Saint Nicholas providing dowries for three poor girls by dropping sacks of gold down the chimney? A Christmas Carol? The Charles Dickens one with the ghosts, maybe? 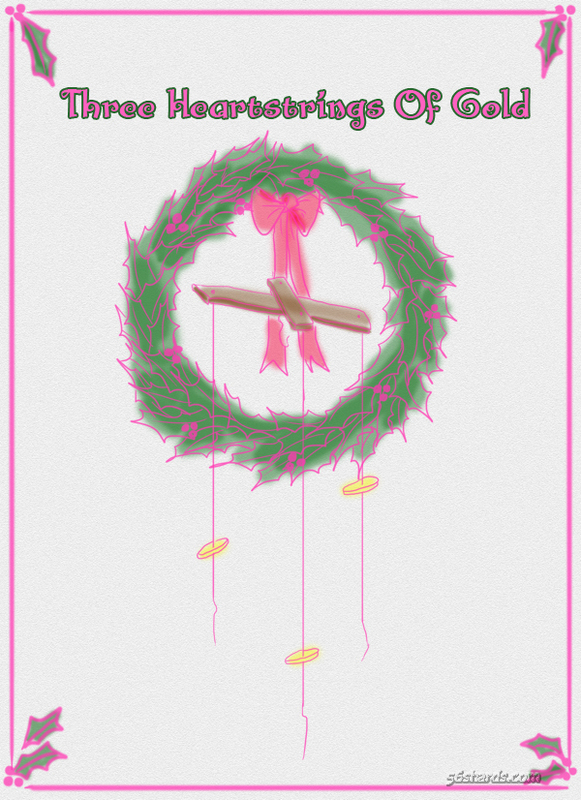 I’m trying to think of Christmas stories with “Three” as a prominent motif. And I think that one is the most famous one. Seros> got the first one! And what, pray tell, could be the second story? Heh. Hint: What is that in the center of the holly wreath? I don’t know what those marionette bars are called. I do know what a bow is called though. Is it another Christmas story? Or a different story, like Pinocchio? I don’t think I’ve read the original Pinocchio, but I do have to ask, how was hanging meant to kill a puppet? I seem to recall from somewhere that in the original version he was killed by being hanged with a noose around his neck from a tree. Or something. You did read that correctly. In researching the story, the Fox and Cat dressed as bandits and attempted to kill Pinocchio but in the end he was rescued and nursed back to health by the Fairy with Blue Hair, aka Blue Fairy, whom you have already seen in the comic. She is a shape drifter — an entity whose very appearance changes with the beliefs and experiences of those around her. To Velvy, she looks like the Blue Fairy. To Cindy, she is the Fairy Godmother. To David, she appears to be an angel, etc. Well, for the story of Pinocchio, that is the other half, yes. As for being hanged… I’ll look that up. Don’t think I’d heard that version. That sounds… epic! I have begun researching the Pinocchio story but hadn’t come across that one. Man, Seros, you got both of them! Good job on the guesses. Yay! I got it right! This story will definitely be interesting.